I love pizza, but it’s not a low carb food. 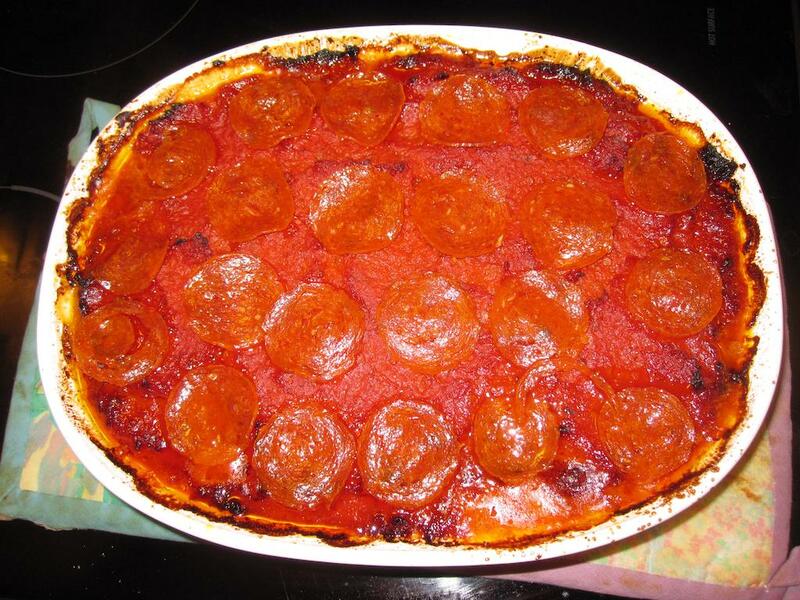 This is my close substitute, a variant of deep dish pizza, made without a crust in a casserole dish. It is not super low carb, but it is fairly low carb. It’s not really LCHF (Low Carb High Fat) but it is close, if your carbs for the rest of the day really are zero. Preheat the oven to 350F, or 325F if you use convection mode (which I do). Drain the pizza sauce in a sieve to remove as much of the liquid as you can, so the resulting pizza will not be too soupy. While doing that, cook the sausage in a pan. Put a thin layer of the pizza sauce on the bottom of the casserole dish. Sprinkle mozzarella cheese on top of the sauce, about one packet, maybe a bit less. Then add about half of the sausage and one can of drained mushrooms. Put another layer of cheese on top, then half the pepperonis, for my casserole dish I find I can fit 22 of them. Then put the rest of the sausage and another drained can of mushrooms on top. Then put the rest of the cheese on top, then put the rest of the pizza sauce on that. Remove, turn off the oven, and add pepperoni on top, place back in the oven and finish for about 10 or 15 minutes until the pepperoni has crisped up a bit. What some refer to as Baltimore’s version of BBQ isn’t BBQ at all. Of course, what would someone from the New York Times know about BBQ? I’m referring to the pit beef sandwich. First, the roast. 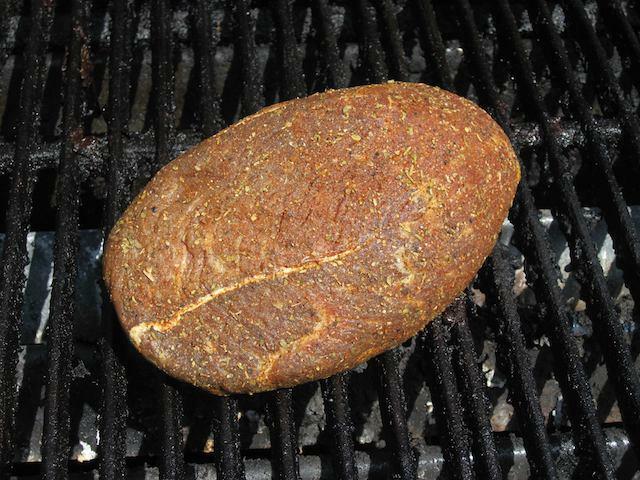 I prefer sirloin tip, although some use top or bottom round. I don’t like the latter due to the thick wedge of fat then runs through it. I’ve heard of people using eye round, but grilled eye round is barely fit for human consumption, so I really can’t suggest that. 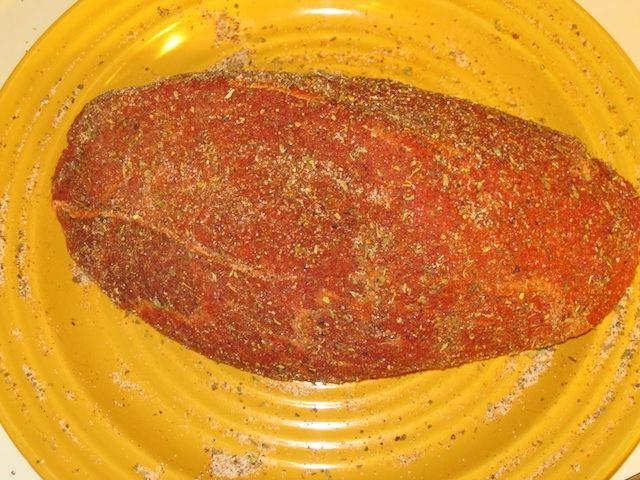 Next, the spice rub. 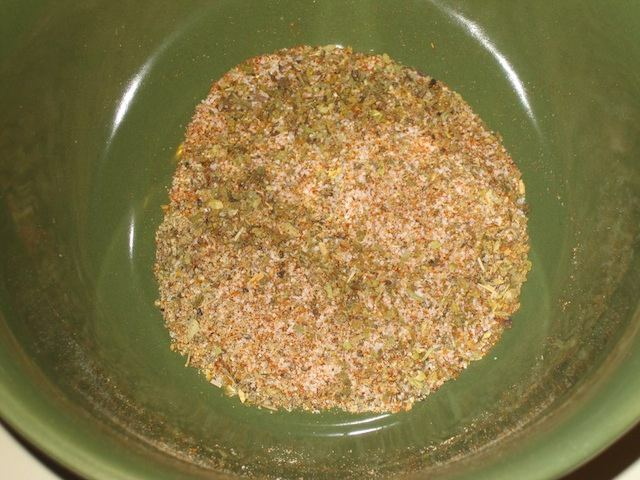 I use two portions of salt to equal portions of ground red pepper, onion powder, garlic powder, paprika, oregano, and a little ground red pepper. There’s no exact science here. 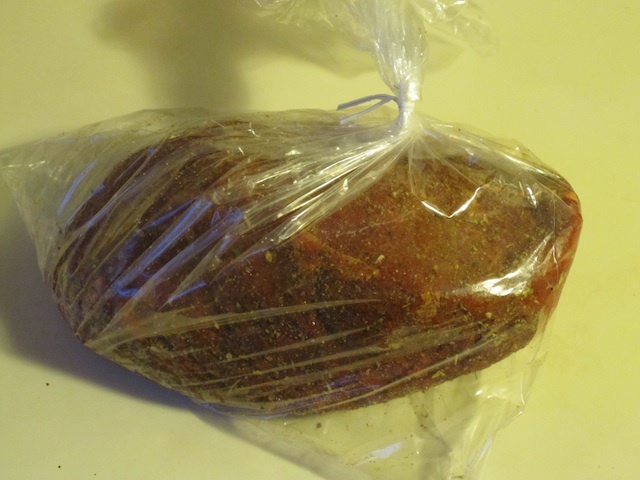 Coat the entire roast with the rub. Then put it in the fridge at least a day before you’re going to cook it. 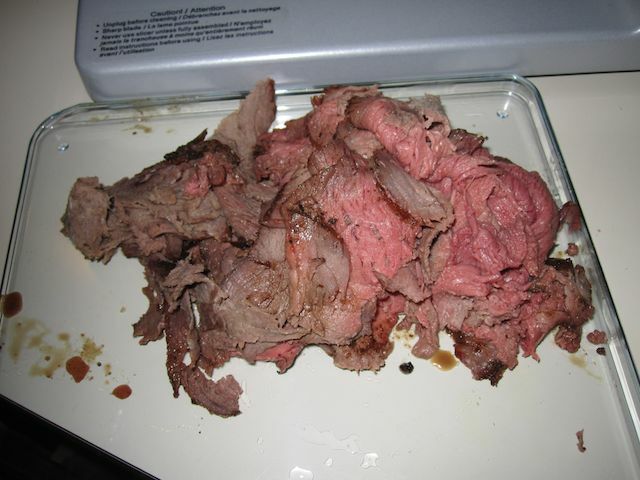 Next, take the roast out of the fridge, and let it sit on the counter for an hour or so, to warm up a bit, so when you grill it, you’ll maximize the volume that stays at medium rare. Of course, the USDA food safety police say this is a dangerous food safety violation. Meanwhile, get your grill going nice and hot, and put the roast on. Grill with the lid off on high heat. When your instant read thermometer says 123F, you’re done. 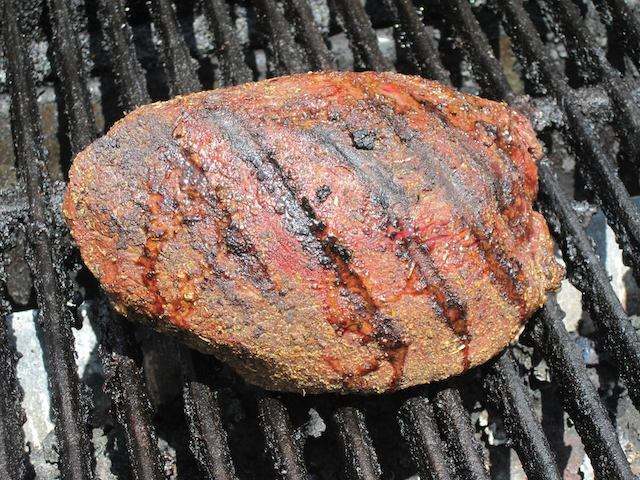 That’s medium rare. 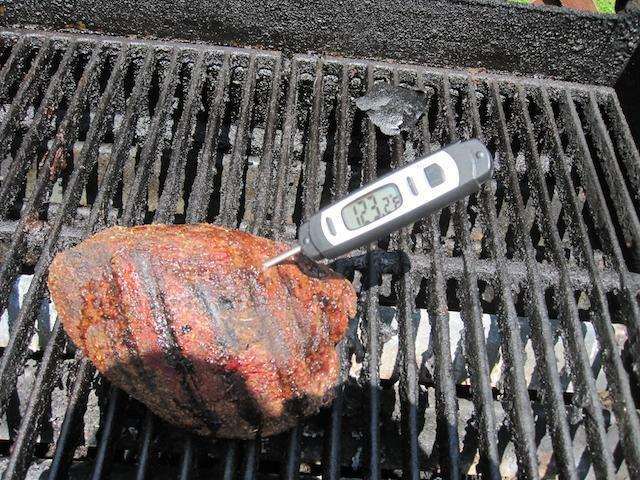 The USDA says 145F is medium rare. They’re idiots. 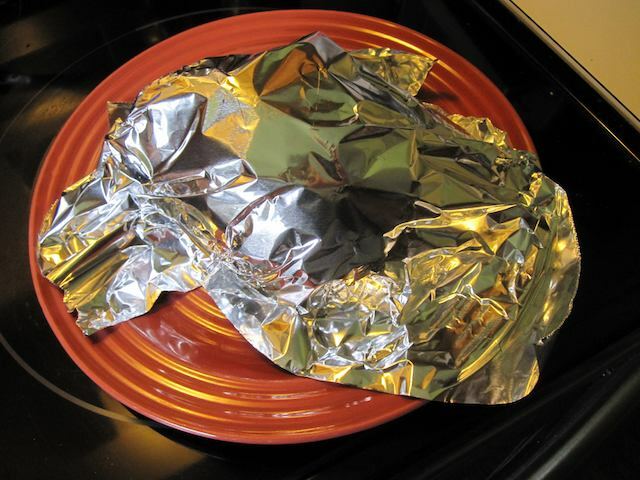 Next, you want to tent your beef under aluminum foil, to let it rest, so you don’t lose the juices. Don’t skip this step. 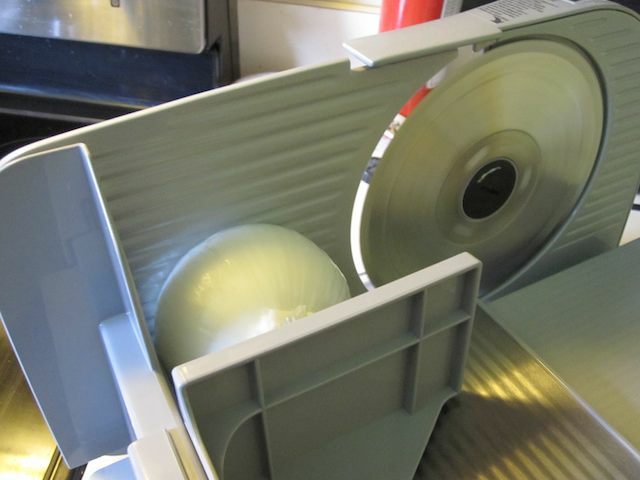 While your beef is resting, you want to slice your onions. 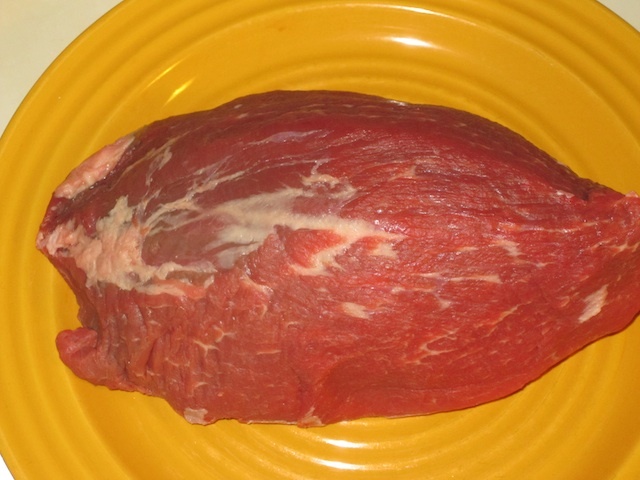 I use an electric meat slicer, since I’m going to use it to slice the beef anyway. Slice your beef thin as well. Sure, you can use a knife if you’re good at it and not lazy. Me, I’m lazy. 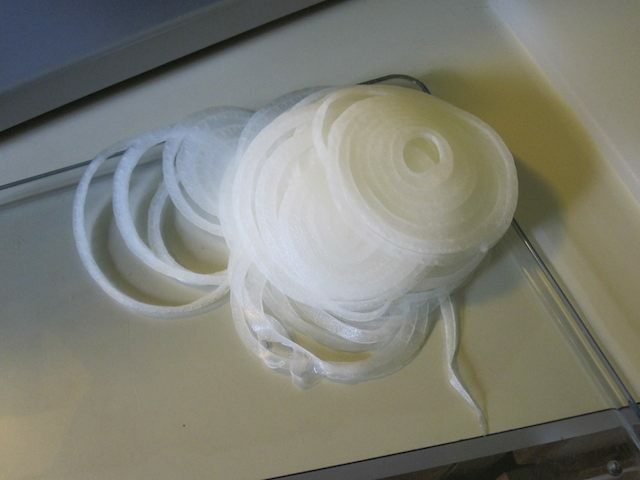 And I have a deli slicer, so I may as well use it. 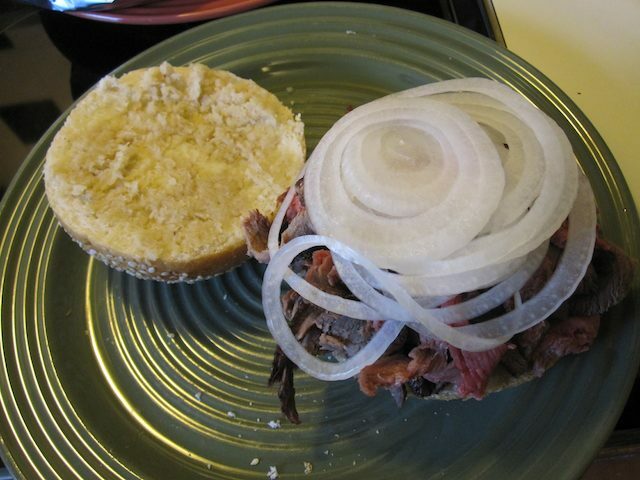 Put some horseradish on your bun, the beef, and the onions. If you’ve got mayonnaise, throw it away now, before someone uses it. Serve with chips. Ideally Grandma Utz chips, cooked in lard. The radio connection? 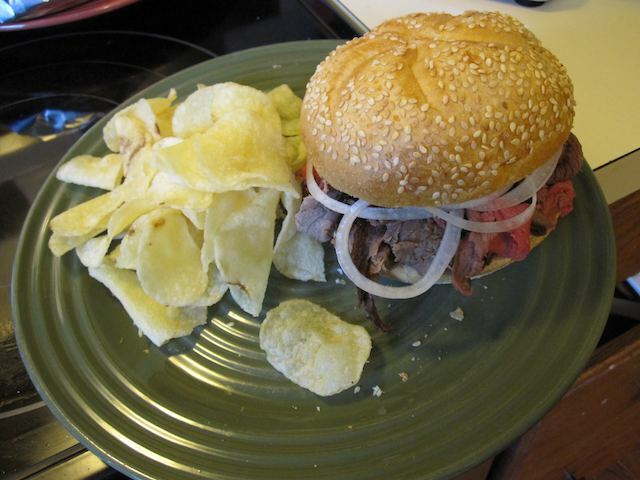 The Baltimore Hamboree and Computerfest held at the Maryland State Fairgrounds used to serve pit beef sandwiches. Now that there’s no outdoor tailgating, I’m not sure if they do anymore.